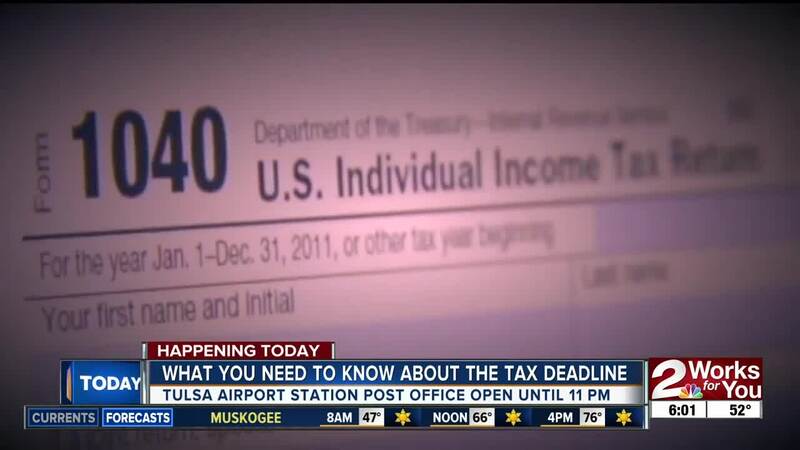 TULSA — Taxes are due to the IRS today, and a Tulsa Post Office is staying open late to accommodate people trying to get them out before the deadline. The Airport Station USPS location at 2601 North Cargo Road will stay open until 11 p.m. Monday to ensure mail is postmarked April 15. For those who who choose to go to one of the other seven locations, USPS encourages looking at the times the mail is collected from the boxes. If the tax forms are dropped in a mailbox after the last listed pick up time, they will not be post marked in time. USPS also wants to remind people to put enough postage on their mail. They said the IRS will not accept mail with postage due. Tax-preparers across Tulsa are expecting to see a rush of people as the deadline quickly approaches. Lewis Weatherl, manager of Liberty Tax Service on South Peoria, said they expect to see more than 40 people who need help filing their taxes or filing for extensions. He said people wait until the deadline because they either know they are going to owe money or because they just put it off. Some will spend less than 30 minutes with Weatherl and his colleagues, whereas more complicated cases will take longer. Weatherl said people who are seeking help today should bring their photo ID, social security card and relevant tax documents, like W2s or 1099s. "Always stay calm," Weatherl said. "No need to get frantic. If you don't have all of your documents, we should do an extension and that doesn't take very long and that buys you an extra six months." Liberty plans to stay open until they help the last customer in their lobby. H&R Block at 71st and Memorial will be open until midnight.